Takeaway: There is still so much to learn about the role of calcium in plants, but this common metallic mineral certainly already has applications for preventing and treating blossom-end rot and other problems in the growroom. The metallic mineral substance known as calcium (Ca) remains rather ambiguous. It is silvery, dull gray and has little monetary value to mankind. Nevertheless, calcium is the fifth most plentiful earth element and is found largely in limestone and gypsum. It’s an essential component of bones, teeth, insects and sea shells. Calcium was quickly put to use by plants and their cells as they colonized the earth’s early land masses. While it is not considered a major plant element required for growth, calcium is essentially a macro element in the garden patch. It is an alkaline metallic mineral known to moderate and neutralize acids and soils. This obscure mineral holds the super power of Kryptonite in growing vegetables and fruit. A grower risks destroying the best fruits if they lose even a small quantity of calcium from a plant. And, since the sight of fruit that is deformed, split, or blackened and rotting at the blossom end can send a grower reeling, minding calcium levels comes highly recommended. However powerful and abundant in soil, calcium is often highly susceptible to localized restrictions that prevents its uptake into plant root systems. This can be caused either by poor soil moisture levels, salinity, displacement of competitive cations or lock-up caused by bicarbonate molecules. Highly water soluble, calcium moves within a soil solution around the root zone as it awaits transport up a plant’s calcium highway – the xylem. After calcium is taken in by the plant, it is transformed into calcium pectate and distributed among a plant’s many components. It then accumulates within the fruit’s cell walls, where it eventually provides strength, structure and elasticity to the cells. Today, calcium supplements are available in an assortment of compounds and mixes for use in gardens. As limestone, it is used to moderate and raise low pH, often boosting the soil’s component of calcium upwards of 70% or more. Applied as gypsum, it helps raise the soil’s proportion while maintaining pH at a desired level with the addition of a secondary element, sulfur. Calcium is often blended in modern chelated liquid versions that can contain a host of fertilizers or micronutrients, and it has become so popular in gardening circles, it is often included in the same breath as nitrogen, phosphorus and potassium (NPK). Most are keenly aware of the balance of power that calcium plays in the soil. It helps nullify the effects of soil acids by lowering pH and it competes with other cations in the soil, helping to maintain an appropriate balance. Reduced calcium uptake into the fruit sink is a grower's main cause for concern, and results include fruit abnormalities, blossom-end rot (BER) and other problems like reduced fruit weights and lower harvest yields. Calcium is typically mobile in moist soil conditions. It is easily absorbed by young, adventitious and unsuberized roots through the casparian strip. "Calcium is required in relatively large concentrations for normal cell growth. When a rapidly growing fruit is deprived of necessary calcium, tissues break down." Calcium is then transported within the xylem through evapo-transpiration. The fresh supply is carried up this one-way highway within the transpiration stream to the evaporative parts of the plant. It is often the leaves that tend to transpire larger amounts of water, thus receiving the lion's share of the mineral. Young, developing blossoms and fruits suffer during periods of high canopy evaporation, or calcium uptake stress. Xylem flow diverted to the leaves sets the stage for a grower’s blossoming demise. Blossom-end rot is not caused by parasitic organisms, but by physiologic disorders associated with lowered calcium soil availability and water stress conditions that ultimately affect the fruit’s interior structure at its distal end. Environmental factors causing high evapo-transpiration rates of the leaves also enter into the equation by limiting the availability of nutrients sent to the fruit sink, fostering the development of BER. Nutrient imbalance often plays a major role in the inhibition of calcium uptake into the plant. Factors affecting uptake of calcium are often caused by excessive levels of other nutrients. All of these soil components need to be held in balance and kept in moderate proportions for good fruit development. Calcium is required in relatively large concentrations for normal cell growth. When a rapidly growing fruit is deprived of necessary calcium, tissues break down. The process of blossom-end rot and exterior wall case cracks begins when demand for calcium exceeds supply. The occurrence of BER is usually preceded by a period of water and calcium supply stress that hinders or stunts the fruit at critical stages of growth. New fruit in the beginning stages develop internal distribution networks of cells and pathways within the pedicle, stalk or peduncle called vacuoles or membranes. Development of adequate membranes for distribution of xylem flow into the fruit just after pollination is vital. 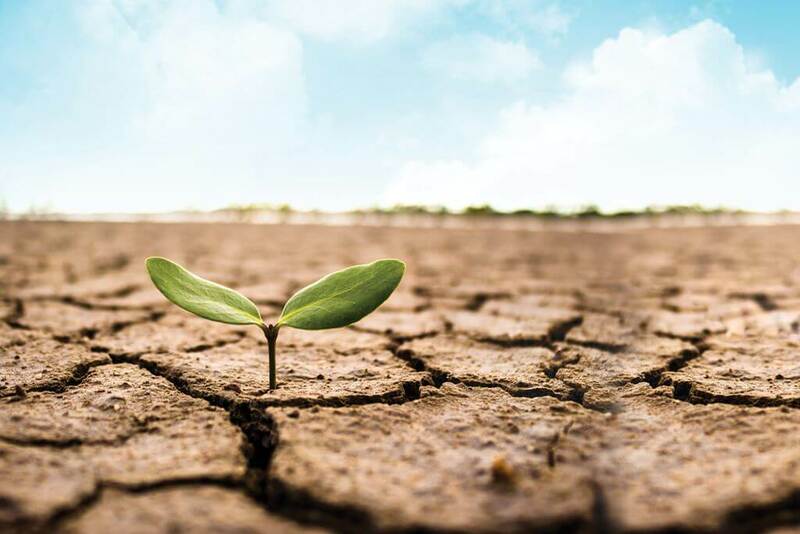 Plants grown at low water availability in the root environment have been found to have xylems with higher resistance, diminished pathways and membranes leading into fruit. The circumstances causing restricted calcium availability during fruit formation is referred to as pedicel hydraulic resistance. This basic limiting factor might eventually progress to the early demise of many fruit near or at maturity. This assumes young developing fruit deprived of calcium during rapid growth are left crippled with reduced xylem flow and limited calcium importation abilities. This translates into deformation of the calcium highway that transports flow into the fruit. The condition is thought to persist into the fruit’s maturity. Soil moisture content plays a critical role in the movement of calcium in the soil and its uptake by roots. Without sufficient soil moisture, calcium mobility will be lost in the root zone. On the other hand, soil that is too wet results in anaerobic conditions, further restricting intake. Calcium is absorbed only by young adventitious root tips in which the cell walls of the epidermis are unsuberized. Suberin is a waxy, cork-like substance through which water and nutrients cannot move. Formation of suberin layers operate to protect plant root surfaces from water loss. Once the suberin layer develops in these cells, water and calcium can no longer be absorbed in sufficient quantities necessary to sustain increased fruit size. Avoiding drought stress and wide fluctuations in soil moisture by using mulches and irrigation is important. Even a brief soil-water deficit can disrupt water and nutrient flow in the plant. If this occurs while fruit is developing, future blossom-end rot will likely develop. Plants generally need about 1 in. of moisture per week from rain or irrigation. Even more is required during drying winds to ensure proper growth and development. Additionally, excessive evaporative leaf canopy stress from warm days with low humidity and drying winds contributes to BER by increasing the demand for xylem flow. Suitably tested, quality irrigation water should be used during this time. Irrigation water might be a required treatment, with a pH as low as 5.5 to release the calcium bond of bicarbonates. Mulching serves to maintain an even level of soil moisture and should be practiced where feasible. Caution is required as some mulches containing high ammonium nitrogen should be restricted. Leaves and straw high in carbon make the best mulches. Restrictions that limit calcium supply for transportation to the fruit ultimately lead to the demise of the plant’s offspring. Reduced uptake and movement of calcium into the root zone and fruit sinks are therefore major concerns. When compared with hot, humid days, the warm, sunny, low humid and windy days wreak havoc with the plant’s internal moisture regulation systems. This is especially true if the plant is not accustomed to the sudden change in weather. Above: Blossom-end rot on tomatoes. Rapid, vegetative growth due to excessive soil-applied ammonium nitrogen fertilization can cause blossom-end rot. 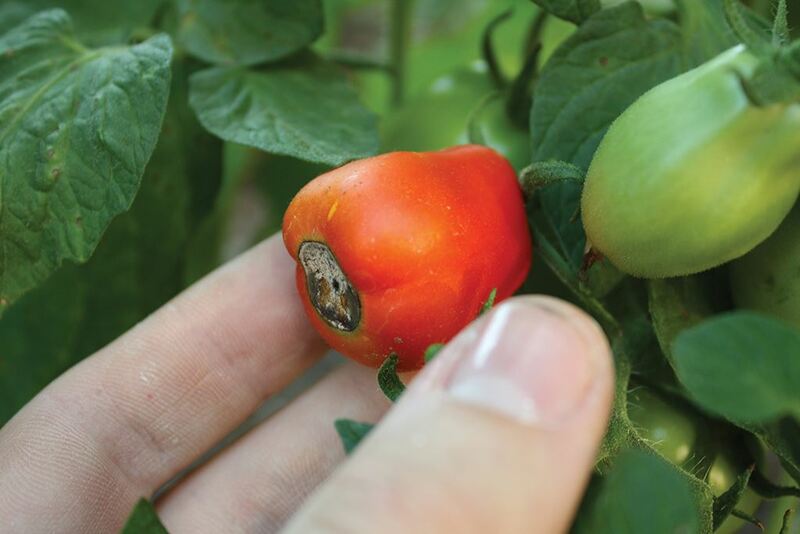 These forms of nitrogen enhance growth, photosynthesis and fruit quality. However, ammonium ions might compete with calcium and significantly restrict its uptake. Plants evolve in environments that normally contain less than 5% organic matter. In most of the modern, amended garden patches, soils may contain levels in excess of 10% or more. High garden soil concentrations of organic matter and the sudden influx of ammonium nitrates released from the decaying organic matter may begin to swing the soil out of balance. This, combined with the decaying beneficial micro-organisms accelerating the release of competing nitrates, results in a rapid expanse of the leaf canopy. Increased photosynthesis and sudden carbohydrate production can also result in BER. Increased sink deposits enlarge fruit deprived of calcium, thereby placing stress on expanding cell walls as seen in splitting distal ends of fruit. Avoiding fertilization of ammonia-cal forms during and prior to fruiting stages may help ease this condition. Nitrates or calcium-chelated supplements with high soluble nitrogen sources should be used sparingly, applied via foliage or the root zone by drip irrigation at low strengths, or eliminated entirely during fruit formation. Supplemented phosphate and phosphite fertilizers with calcium drenched into the root zone ensure availability and offer some protection. Foliar applications of calcium, which are often advocated, are of little value because of poor absorption and movement to fruit where it is needed. It is not mobile and does not move from leaves to the fruits. Thus, foliar canopy sprays of calcium are generally ineffective in controlling BER. Much is yet to be learned about the role of calcium in plants, but enlisting these prevention tools can effectively combat the frustrating fruit calamity of blossom-end rot. 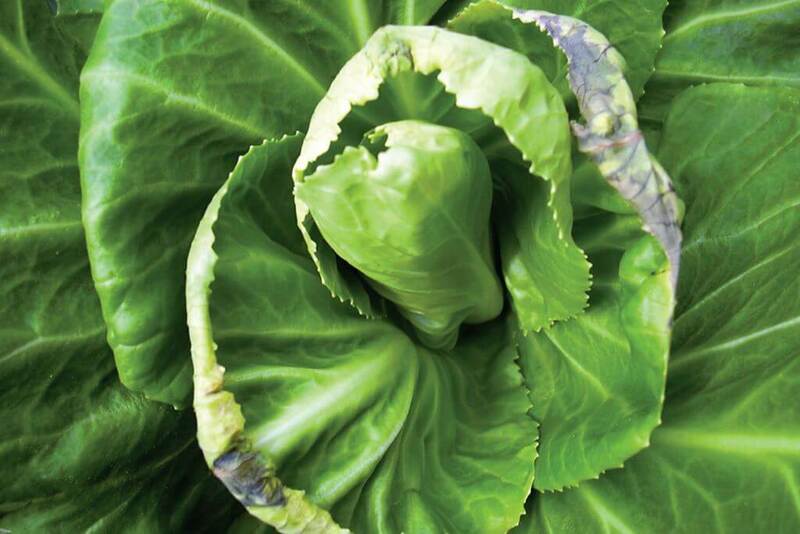 Above: Calcium deficiency in leafy greens.